This photo is of my husband and I (bride and groom), and our amazing neighbors. We were attending a Halloween fundraiser costume party. We wanted to do a group costume as we were all sitting together at one table. While racking our brains for a unique group costume, my husband and I were discussing our excitement for this party because it was going to take place in the facility where we were married back in 2009 – any excuse to visit was exciting! As we were talking, the idea hit us. Why don’t we go as a wedding party? 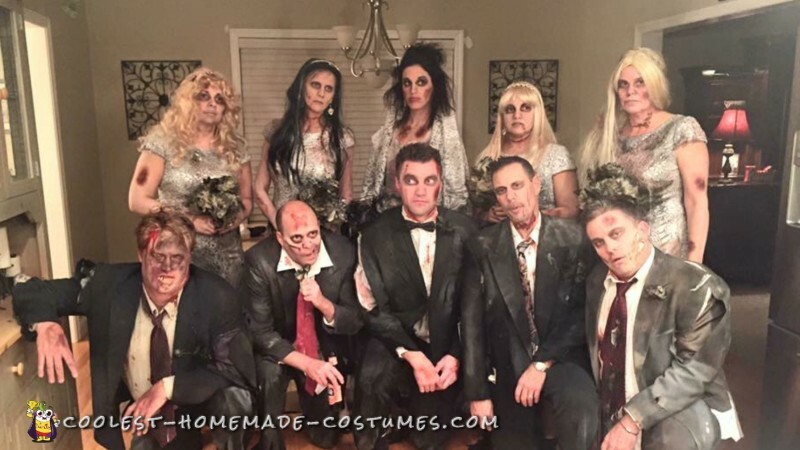 A Zombie wedding party! 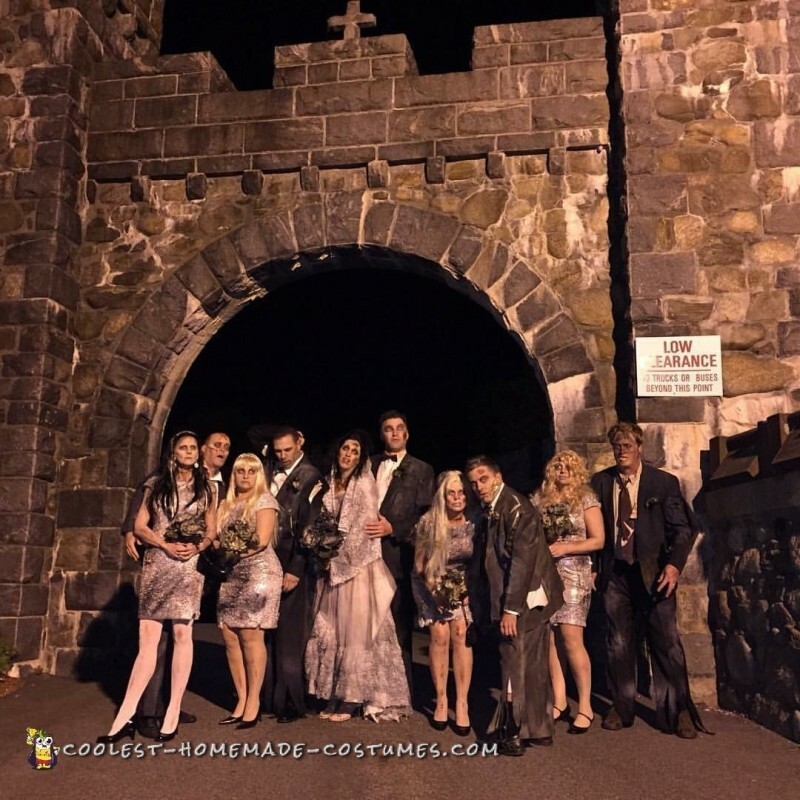 We loved this idea because we could have a themed group, and our ability to be creative with our costumes was unlimited. we also loved the idea of getting “married” again at our special place! The bride’s gown was a vintage wedding dressed purchased from Etsy. It was a pure wedding dress (white and beautiful) and even was sent with a letter, “congratulations on your wedding!”. The bridesmaid dresses were purchased at JC Penney. The groom and groomsmen used old suits they owned. To get the look, we used a combination of grey, black and white spray paint. We tore the bridesmaid dresses and suits to look raggedy. We splattered Zombie Blood that we purchased at the Halloween store all over the outfits. The flowers were purchased from Michael’s craft store and spray painted. the bride’s veil was fabric purchased at JoAnne Fabrics and spray painted and bloodied. Our makeup was done by us, and some of our kids. We used powder and bruise/zombie makeup purchased at the Halloween store. We used zombie blood and fake wounds. The bridesmaids all wore wigs, while the bride teased her own hair. We entered the facility in true bridal fashion – two lines with the bride and groom first, followed by the wedding party couples. We entered walking like zombies, moaning and groaning. The bride hysterically crying. Needless to say, people loved it! They thought we were very clever, and even asked if we had our makeup professionally done! Throughout the evening, we stayed “in character”. We really acted like we were at a wedding massacre. We were so excited when our group won the Best Group Costume award! This was by far my favorite Halloween costume! I love Halloween and coming up with creative costumes, but to have all of our neighbors come together and really get into their “characters” made this night one to remember! I cannot imagine another group able to top this! Every detail was done with care and precision, and we did not have to spend very much money to pull this off. If we are lucky enough to win, we will split the winnings and celebrate as a true team would! Cool DIY Crayola Crayon Costumes for Quintuplets!